Hold your next conference, event or meeting at one of the leading Nordic meeting hotels. Scandic Infra City, with Scandinavia's largest indoor tropical garden, is located just 15 minutes from Arlanda airport and 20 minutes from central Stockholm. We are the arena for both small and large conferences. We have our own exhibition hall, banquet hall and congress hall, which can accommodate up to 1,800 people. If you are looking for something spectacular, we recommend our 650 sqm penthouse suite, with its meeting room for 50 participants. Keep in shape at the gym and pool in our relaxation centre, and relax in the sauna afterwards. Then enjoy a drink or delicious meal from our a la carte menu in our hotel restaurant, Flavours. Our restaurant nestles in an open atrium courtyard with glass ceiling, surrounded by a tropical garden with palm trees and a waterfall. Just a few blocks from our hotel you can follow a hiking trail, enjoy a massage, join an aerobics session or play a round of golf. 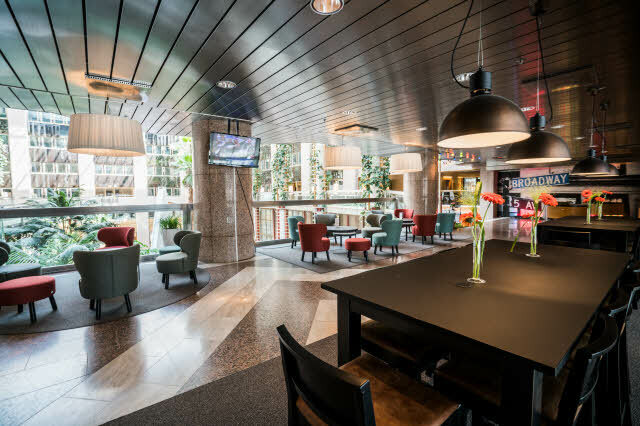 Hold your next conference or important meeting at Sweden's nearest hotel. 15 minutes from Arlanda and 20 minutes from central Stockholm. As the leading Nordic convention hotel, we are an arena for conferences of every size – from small to extremely large.